Let’s face it, sometimes there is not a tool for every job. In commercial baking and pizza operations, existing pan inventory often acts as a limiter to new product ideas and increased efficiencies. 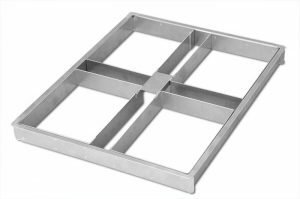 Ordering custom baking pans is an option, but the thought of investing significant time and money on a “hunch” often scares food manufacturers away. However, advances in manufacturing technology and streamlined distribution channels have made commercial custom pans feasible for small and large food processors alike. In fact, 2016 was our busiest year ever for custom pan production. We engineered custom pans for some of the largest pizza chains in the world, massive wholesale bakers and some of the most innovative retail bakers and pastry chefs. 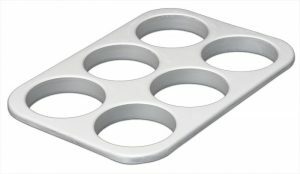 We’ve developed quite a reputation in the industry for low to high volume commercial custom pan production with surprisingly short lead time requirements. As we look forward to an exciting 2017, we’d like to share three of our favorite custom pan projects from the last year. 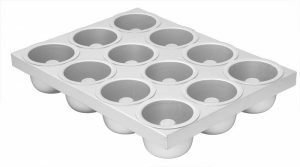 One of our great baking customers needed to produce cakes with a cavity size that was quite a bit smaller than a standard sheet pan extender with ¼ sheet dividers. The bakery’s current pan setup was generating too much waste, and profitability was diminished. Our custom pan solutions team met with the customer to develop a prototype pan in our manufacturing facility in Spokane Valley, Washington. After testing on the customer’s line, we made some slight adjustments and manufactured a custom pan that minimized waste and that contributes to the company’s bottom line. A dessert manufacturer had successfully launched a new tart product, but found its current setup was not keeping up with production requirements for high-speed operations. Our custom pan solutions team designed custom tart cup rings that fit the company’s existing automatic depositor/forming line. The custom tart cup rings were exactly what the manufacturer needed to keep up with demand. Perhaps our most complex project to date, this custom pan job needed to accomplish a couple of important goals. First, it had to feature a dozen cavities to keep up with production volume. Second, the customer required a pan coating solution that minimized clean-up and did not require re-glazing. These two goals made it a difficult job, but one we are built perfectly to fulfill. We manufactured a custom pan prototype in our Spokane Valley, Washington facility that featured our proprietary stick-resistant Silver-Kote® finish. This coating finish not only made depanning easier, but it also meant our customer could save money by not having to re-glaze pans. For each of these bakers, overcoming initial fears of ordering custom pans resulted in either increased sales, improved profitability and/or decreased waste. We’ve got quite a few new custom pan products on the schedule for 2017, and would love to talk to you about your ideas to run your bakery or pizza operations better through pans built specifically for your needs. Learn more about our custom solutions or contact us with questions.